Goldman Sachs (GS) Downgrade – Heresy? 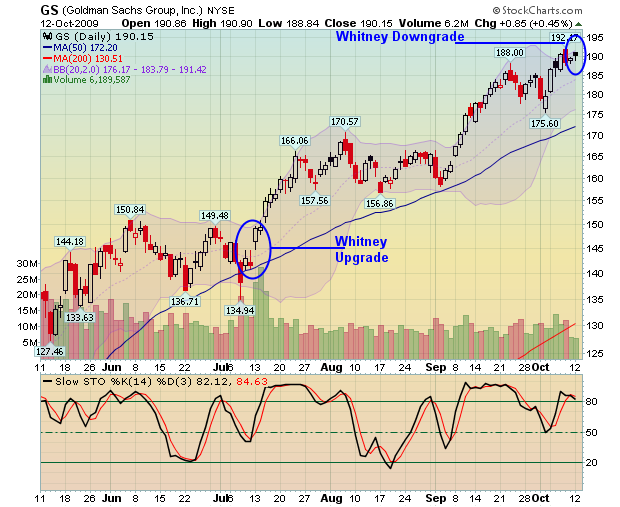 In another interesting move, Meredith Whitney cuts her rating on Goldman Sachs (GS) just before earnings on Thursday. This is reminiscent of last quarter. If you remember, it was a Monday morning and markets were continuing to sell off more than 7% over the previous few weeks. Then, she announced on CNBC that Goldman was going to provide blowout numbers and raised her rating and price target. That provided a quick turn for markets as it turned a 1% early loss for the S&P 500 into a 2%+ gain by day’s end. Financial stocks exploded and the world cheered. She did clarify that it was not a commentary on the broader economy or on other financial stocks. But that did not matter as it was taken as a buy-the-dip signal. Goldman has seen profits rise through debt and equity offering business and their magnanimous prop trading group. The low cost of funds has also helped as they are now able to borrow as a bank since their conversion in 2008. Analysts are looing for quarterly EPS approaching $4.25. Whispers are approaching $5.00 and that may be a high hurdle this quarter. Depending on which revenues drove EPS will determine the direction of the shares. Look for stable trading profits and a good percentage of deal revenue from the fixed income division. Also, note the amount that has been set aside to continue to build the balance sheet. Will she appear on CNBC with the bad news? Hmmmmmm…..
Will this cause the rally to stall? What does this mean for Goldman shares? What does this mean for her career? What does this say about other financial stocks? If Goldman’s earnings may be slowing, what does that say for Wells, JP and Bank of America? Oct. 13 (Bloomberg) — Goldman Sachs Group Inc., the biggest U.S. securities firm before converting to a bank last year, was cut to “neutral” by Meredith Whitney, as the analyst dropped her only “buy” recommendation. Whitney, who correctly predicted in 2007 that Citigroup Inc. would cut its dividend, didn‘t update her price estimate on the shares in a summary note distributed to investors today. Further details on the downgrade weren‘t immediately available.